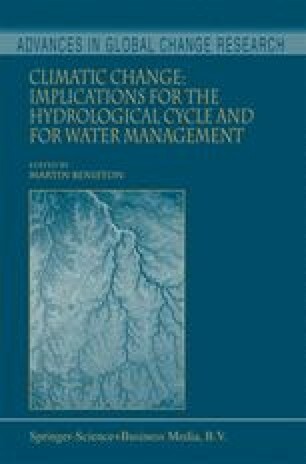 Structure and composition of vegetation influence the local water budget by transpiration and interception. On the other hand soil water content crucially affects plant physiological processes such as nutrient transport or photosynthesis. These processes in turn partly determine biomass production, plant growth, survival and competition and, thus, vegetation structure. This vegetation-hydrology feedback has the potential to influence the impacts of a changing climate on vegetation and hydrology. However, only few simulation studies include this feedback explicitly. In these studies vegetation models are linked to hydrological or climate models. On the local scale, the used vegetation models are complex and slow. On larger scales, the vegetation and its dynamics are usually modelled in a simplified manner. Particularly vegetation structure is either ignored completely, e.g. by using the leaf area index (LAI) averaged over large areas as state variable, or reduced to few canopy layers and plant functional types. To examine the effect of vegetation structure and the effect of the vegetationhydrology feedback on drought and vegetation under a changing climate, we coupled the dynamic forest model DisCForM with the soil water budget model WAWAHAMO. DisCForM is a highly efficient model, designed for regional scale applications over decades and centuries. It simulates horizontal, vertical, and species structure in a forest stand. Simulations of forest development and drought stress occurrence were performed with the coupled and decoupled models at several typical sites in Switzerland. The results indicate that vegetation plays an important stabilizing role regarding the impact of a climatic shift on hydrology. By adaptation, i.e. the lowering of LAI and the reduction of cover grade by changed mortality and growth and the exchange of tree species, the vegetation itself is able to counterbalance the influence of climate change on drought. This stabilizing effect is particularly pronounced at the currently dry forest sites. At wet forest sites, the positive effect of a warmer climate on biomass production appears to overwhelm the negative effect of the strengthening of drought. To study the effect of structure, simulations with reduced horizontal and vertical structure and a reduced species set were compared to those with full structure. Reducing structure had minor effects on drought and moderate effects on vegetation in the long-term average. Under medium dry conditions, however, reducing all three kinds of structure simultaneously resulted in lower drought and LAI values. Furthermore, deviations in single years were considerable. We concluded that neglecting structure in vegetation-hydrology-models can lead to wrong drought values for single years and to a systematic underestimation of drought in the long-term average under dry conditions. In contrast, neglecting the feedback can lead to an overestimation of drought.